A schedule for twin babies, how important is it? 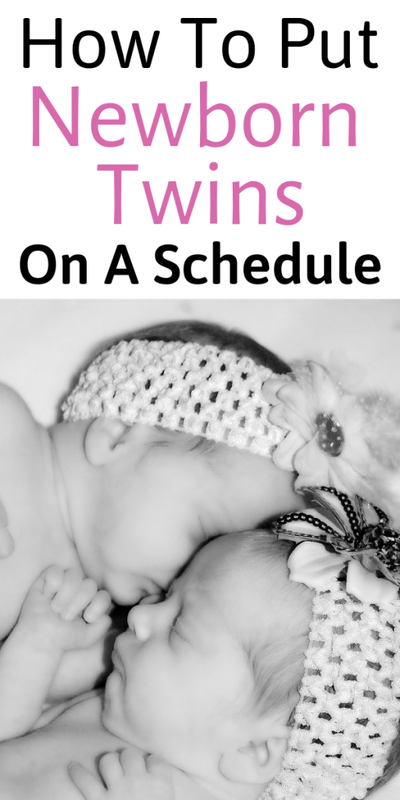 If you are a twin mama or pregnant with twins establishing a schedule is probably one of your biggest questions. 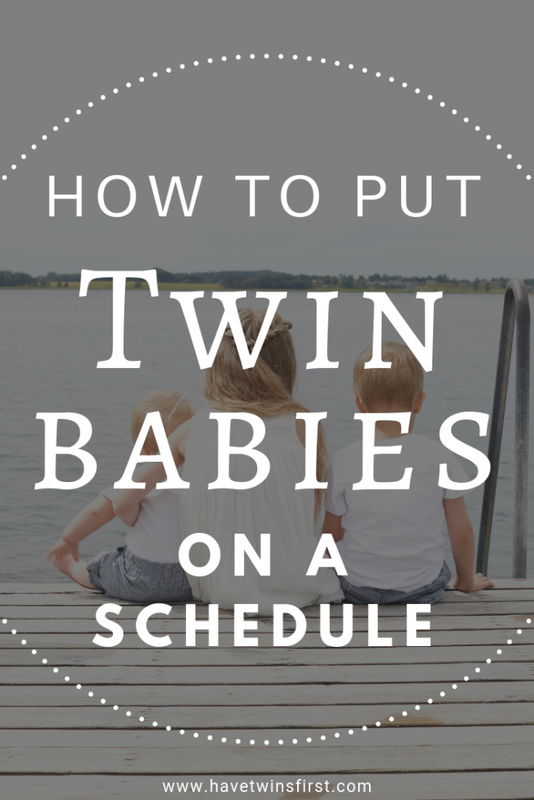 This post will cover when twins can be put on a schedule, how to put twins on a schedule, and the importance of establishing a schedule with twin babies. The short answer to establishing a schedule for twin babies is to create a daily routine right away. Now, a newborn baby is not going to have nearly as predictable a schedule as a 6 month old. But, what you can do from the day your babies come home is create sleeping and feeding cues. One of the easiest ways to do this is start an eat, play, sleep routine. This will not always go perfectly, but an eat, sleep, play routine allows your baby to start learning what to expect. Another tip for starting a routine during the first 3 months. During the day make the house really bright and lively. Be sure to make a lot of noise. At night, present a more calming, quiet atmosphere in the house. At first, newborns will not care about day and night, but this will help guide them to recognize bedtime as they get closer to 3-6 months old. As far as putting your twins on the same schedule during the first 3 months, it is highly unlikely that they will always eat and sleep at the same time. But, implementing eat, play, sleep will help you get there quicker. 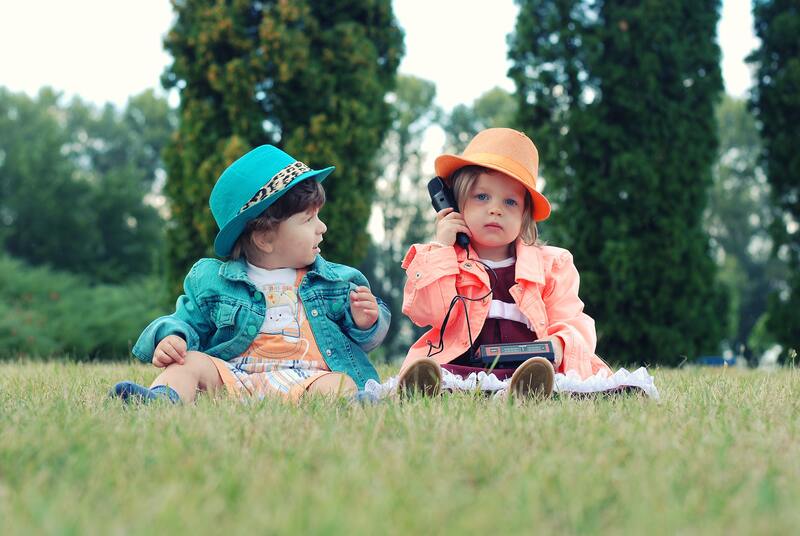 Sometime around 3-6 months your twins will be capable of being on the same schedule. A general rule that is helpful for new moms, every 3 months during the first year of a baby’s life, having a reliable schedule gets easier. Once your babies are at least 3 months old you can start working towards putting them on the same schedule. However, do not stress if it’s not happening at this time. It is more reasonable to expect a predictable sleep schedule at 6 months old. At 3-4 months old I had a general idea of when my twins would need to eat and when they would sleep. But, it was not the exact same time every day. Around 6 months old your babies will be taking a reliable 3 naps per day and you will be able to establish the same schedule for them. You can try the routine described below at 3-6 months, and there is a good chance it will work. But if not, do not get discouraged. It might be easier to just wait until your twins are over 6 months old and then try again. With two babies it is difficult to have them on a rigid schedule, but it is important for your sanity to keep them on similar schedules. In order to start and keep a schedule you will follow a 30 min rule. The start of the day will be important. When your babies wake up, feed them at the same time. If one wakes up early and the other stays asleep, this is where the 30 minute rule applies. To keep your twins on similar schedules, wake up the other twin about 30 min after her sibling woke up. You will need to use your best judgement too. Follow these rules for a typical day. If your babies usually wake up at 8am and today one of the twins was up at 5:30am because she’s sick, then it’s not worth messing with the other baby’s schedule. You will be able to get back on track the next day. Continue using this 30 minute rule throughout the day. If one twin is hungry, offer her sibling a bottle or breast too. If she doesn’t eat, offer again in 30 min. When it is nap time put both down at the same time. Since both twins woke up around the same time, they should be tired around the same time too. For tips on the amount of time required between naps, check out this post. After one twin wakes up from her nap, if the other doesn’t wake up, wake her up 30 minutes later. By following the 30 minute rule, you will be able to keep your twins on the same schedule each day. You will also find that your twins will get in a natural rhythm, as long as you stick to a predictable daily routine. I believe it’s great for all babies whether they are twins or not to have a daily routine. This helps babies stick to a predictable schedule, which will help them become good sleepers. Now, for twins, it is important to have them on the same schedule because it makes life for twin parents as simple as possible. The first year with one baby is hard enough, but with two babies it will make your life so much easier if your babies are on the same schedule. 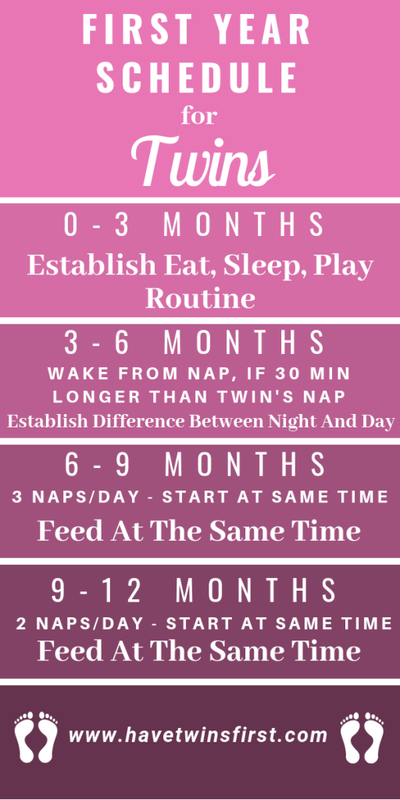 If this post seems like a lot of information to absorb, check out this graphic to help simplify what to expect with putting twins on a schedule. You can even Pin It for future reference too. I hope this post helps give you an idea what to expect with twin babies and their schedule. I also hope you have a better grasp of how to go about putting your twin babies on a schedule. Good luck twin mama, you can do this.